Last night I tp’d Leanna into SL9B. If you haven’t come yet, please get it on your calendar for at least one day in the next nine (only 8 days left after tonight). And by the way, there’s a huge event calendar and by huge I mean every hour, every day till closing. Remember, this is a global event and people are here all day and night. Right now as I write this blog post, there are at least 300 people here. Anyway, we had a grand time exploring maybe six sims — more on this over on Yordie Sands Notebook — but we also made our way to one of the entertainment events on a most amazing set of sims. 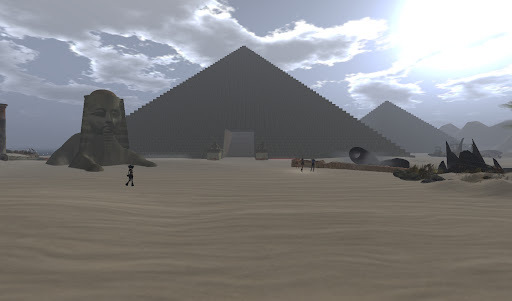 It’s a long story, but as we made our way through the different sims, a relative newbie named Titus joined us and we made and adventure of it as we entered Egypt! near the pyramids of Egypt. That’s me, Titus and Leanna. That’s all of us at the top of the great pyramid. but I’m not gonna tell you anything about that. 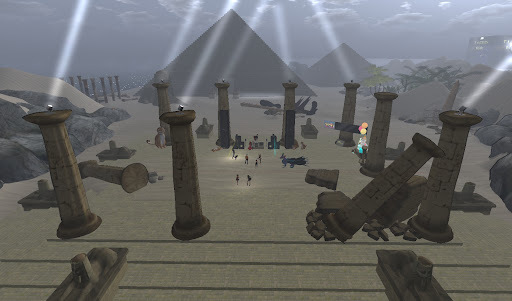 Tip of the day: There is an Egypt Hunt. Here’s a closeup of us atop looking into the great valley. Titus was a pretty cute guy, btw. hehe. Leanna and I had our eye on the desert night spot. We followed the skylights to the nightclub called Shindig. Naturally, we headed right on in. I couldn’t help being reminded of the feeling of a global event. I’d been to the L.A. Olympics and Leanna had been to the Atlanta Olympics and I remarked at how all the people and events had that same kind of festive feel to it. Maybe you’ve been to some big international event like that? Maybe not, but you just don’t know who you’ll me or where they’ll be from or what it will lead to. I love the feel of all this. I hope you will to. Remember, I’m here for you till it closes. Click here for SLURL. Okies, there’s one other thing, very cool. In addition to being a very cool build, Egypt is also the name of a special hunt. This post isn’t about the hunt, but here’s a link to some information for hunt adventurers. It’s called Egyptian Hunt and there’s already two clues. 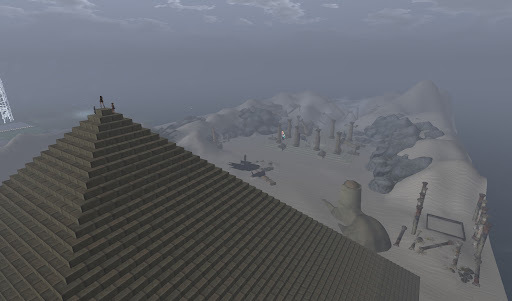 This entry was posted in Exploring and tagged Events, Exploring, Linden Lab, Second Life, Socialite. Bookmark the permalink.